In the hands of oscar115. Use TB2YACY to reference this item. On August 12, 2008, Tod Phillips was riding a motorcycle when he was killed in an accident caused by a left turning vehicle. Tod was the third member of Team Rod & Tod w/KAboom. Tod left behind a wife and two kids. 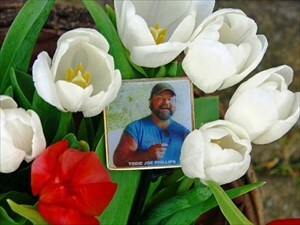 This coin is released in his memory. 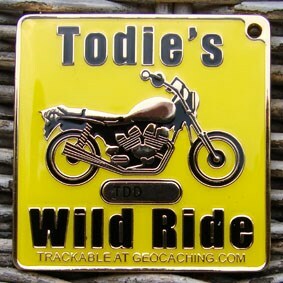 The coin is part of the Bike Awareness project, started by Rockin Roddy. Inattention, inexperience, fatigue, drugs, alcohol, insufficient maintenance, bad weather conditions, speeding and illegal manoeuvres are given reasons for causing accidents. YOU have the power to do something to control each of these factors. Give a good example while riding/driving your self. Practice what you have learned in your driving lessons and from your experience. Ride/drive save and in a defensive, anticipating style. Check your mirrors and watch for the more vulnerable travic participants. Start a discussion and make people aware they can help save lives. Imagine what the effect of spreading this message can be. Picked up in Solvang, CA. Sorry took so long to drop, but found a worthy destination! Ride on!